Beautiful painter sitting in her art studio full of amazing masterpieces and thinking about her new work of art. 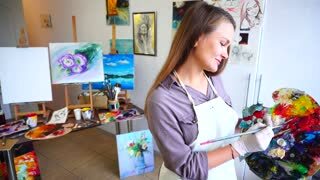 Young smiling woman posing on camera and painting her new masterpiece . Young beautiful painter posing on camera staying near her masterpieces that she has painted. Happy smiling painter sitting on the table and finishing her masterpiece in art studio.